I really like Engelmann spruce. It reminds me so much of Ezo spruce, which my teacher had a love affair with in Japan and so they were quite a few of them in his collection. I think spruce have a very quiet feeling, like a snowfall. It’s tempting to look for big gnarly trunks with lots of movement for spruce as we do for a lot of conifers, like juniper or pine, and that is certainly nice. And yet spruce is also great as a much simpler upright form with a more naturally tapering trunk. The final front was shifted a bit to the left. Needs a bit of growth, especially on the smaller trunk, but there are lots of buds up and down the branches and in several years it will be fuller than I would want it. Spruce buds back very easily on old wood. It’s 38″ to the top jin. Sir Hawthorne, another for the “A” list! Great vision. I saw this tree in person this week at Michael’s place. It’s difficult to have an appreciation for the tree in a picture and I look forward to seeing this develop in the future. Very nice! Please if you would not mind comment on your pot selection for this Engelmann Spruce. This is just a training pot. I have a low rectangle that I’ll be using as a pot this spring, but would actually prefer an oval. Just have not found one that works yet. I was going to suggest an unglazed oval pot for this tree but obviously you are way ahead of me. It is a large and beautiful tree, and should be quite a stunner when the foliage fills out a little. Michael, this is a stunning tree. Looks very old and weathered like it was in a sparsely populated, exposed field high in the mountains. 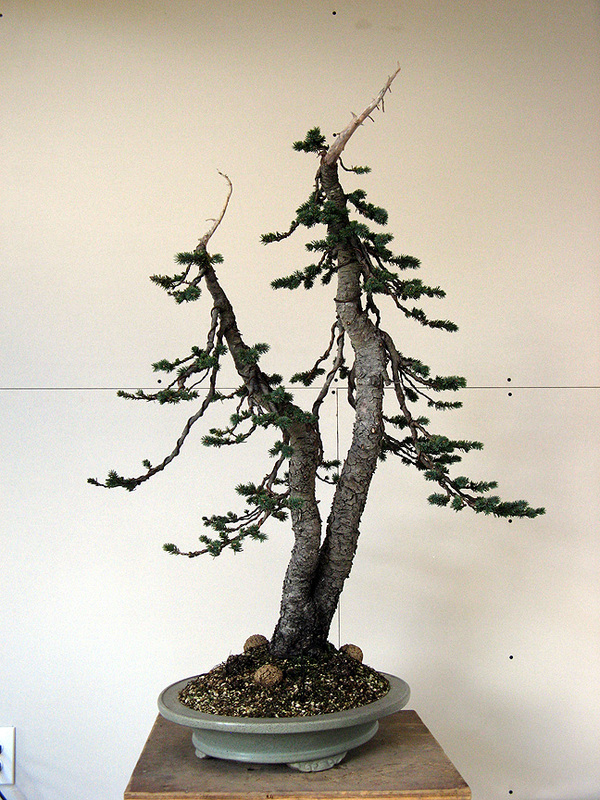 I won one of these last year at a BSOP meeting raffle but I’ve been stumped as to how to go about styling it, mostly because the branches all seem rather brittle. Is there a better time of year to make any bends? Like this one mine is rather leggy and I’d like to bring it in a bit. PS, I hope you are doing another presentation for the BSOP this year, last year’s was very informative and entertaining! 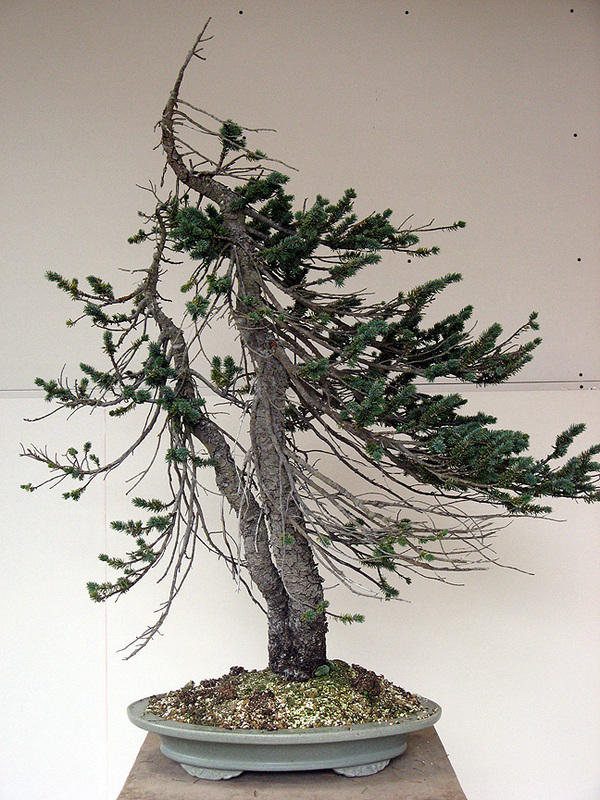 Engelmann spruce is usually a very bendy tree. If you’re trying to bend older branches, those with bark on, it may be snappier. Try growing the tree for a couple of seasons which may introduce some flexibility to the branch. Also, some believe that inorganic fertilizers create more brittle branches. You can work on spruce anytime from fall through early spring before growth starts. Michael, great tip about using inorganic fertilizer. Thanks. Sounds like fish emulsion / kelp is the best bet. I also heard that fertilizing Engelmann from above – directly on the branches and needles is not recommended. Your thoughts? I am not aware of any problems with fertilizing needles on spruce, mild fertilizers should be no problem.